In late 2011, epidemiologist, writer and adventurer Elizabeth Pisani granted herself a sabbatical from the day job and set off to rediscover Indonesia, a country she has wandered, loved and been baffled by for decades. The journey forms the backbone of a book (and a multimedia BookPlus), which includes also reflections on her earlier incarnations in Indonesia. The first of these was as a foreign correspondent for Reuters in the late 1980s and early 1990s. Ten years later she was back in the very different guise of epidemiologist, helping the Ministry of Health better understand Indonesia’s HIV epidemic. That work contributed to her first book, The Wisdom of Whores, published in 2008. 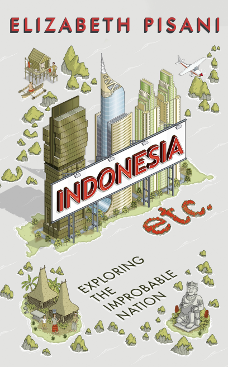 The new book that will emerge in June 2014 will be called Indonesia Etc: Exploring the Improbable Nation. It will be published in the UK by Granta, in the US by WW Norton and in Indonesia by Godown, an imprint of always-inspiring Lontar. Though it looked touch-and-go for a few years at the start of this century, few people now expect Indonesia to face that kind of chaos in any of its vast territory (except, perhaps, Tanah Papua). “Indonesia Etc. – Exploring the Improbable Land” is a vibrant mix of travelogue, history, cultural observation and analysis. One in 30 of the people on this planet is Indonesian. The 13,000 islands of their homeland, scattered along the equator, stretch the distance from London to Tehran, and the residents of the capital, Jakarta, tweet more than those of any other city on the planet. By any standard, Indonesia is a global hub, one of the most dynamic and diverse countries of the 21st century. But you don’t have to look far from metropolitan Jakarta to find poverty, superstition, ancient rituals and black magic. Travelling from volcanoes and jungles to reefs and snowy peaks, investigative reporter Elizabeth Pisani sets out to capture the real Indonesia. On the way she meets the Sultan of Jogjakarta, a former presidential candidate who keeps a posse of albino dwarfs in his court, visits one of the largest red light districts in Asia, joins protesters trying to ban Lady Gaga from their homeland, and takes tea with a recently deceased grandmother. Written with Pisani’s trademark wit and brio, this is an entertaining and indispensable guide to a fascinating country we can’t afford not to know more about. This post was published on 16/01/14 in Science. 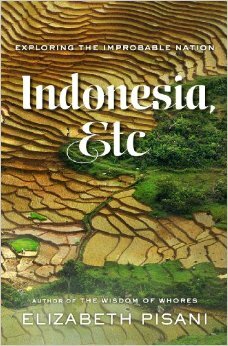 Tags: books, Elizabeth Pisani, Granta, Indonesia, Indonesia books, IndonesiaEtc., travelogue, WW Norton.